We know there are MANY swimming holes in these 3 great states, but since we have only a few so far they are all presented here and without a map at this time. Please send us E-MAIL if you have a swimming hole to add or if you have more information about one that is already listed. Thank you. This swimming hole listing is by www.SwimmingHoles.info . Swimming places in the Shawnee National Forest. For details, see DIRECTIONS below. There are two Forest Service campgrounds very nearby.. POUNDS HOLLOW [POUN]: Small, picturesque lake with official swimming beach at a Shawnee National Forest recreation area and campground. WEB INFO . To get here from Harrisburg, go east on RT 13 about 14 miles then turn south (right) on RT 1 and go about 9 miles then turn right on RT 5600E (Pounds Hollow Rd) and go about 2 miles to the Pounds Hollow Rec. Area. The swimming place is here at a beach on the lake. LAT, LON: lat=37.61566 lon=-88.2736, (source: map) (accuracy: approximate) LINK TO GOOGLE MAP Pretty confident. Not verified. Updated 2/2014. IRON FURNACE [IRON]: A National Register Historic Site, this old iron furnace recreation area has picnicking, hiking and a swimming hole in Big Creek. WEB INFO . To get here from Harrisburg go south on RT 145 about 6 miles then turn east (left) onto RT 34 and go 12 miles then turn east (left) on an unnamed road toward Co Rd 225E and go 3.3 miles (road turns right twice) then turn right onto Co Rd 225E and go 2.2 miles to the Iron Furnace at the junction of RT 225E and RT 12. The swimming place is here in Big Creek. No more detailed directions. LAT, LON: 37.49904,-88.3284 (source: map) (accuracy: approximate) LINK TO GOOGLE MAP Pretty confident. Not verified. Updated 2/2014. BELL SMITH SPRINGS [BELL]: This from the US Forest Service web site: "Bell Smith Springs is one of the most beautiful recreation areas the Shawnee National Forest has to offer. It contains a series of clear, rocky streams and scenic canyons bordered by high sandstone cliffs and an abundance of vegetation unique to Illinois. WEB INFO . The trail system consists of eight miles of interconnected trails featuring strange and wonderful rock formations, such as Devil's Backbone, Boulder Falls and a natural rock bridge. Hiking this system of trails is a favorite activity because of the rock features, scenic overlooks, hidden springs and lush flora and fauna." And there are one or more swimming holes in here also. To get here from Harrisburg, go south on RT 145 about 15 miles then turn west (right) onto Water Tower Rd and go about 2.5 miles then continue straight onto Mc Cormick Rd/Ozark Road and go about 1.2 miles more then turn south (left) on FR 447 past Teal Pond and go about 2 miles to the Bell Smith Springs Rec Area. There are several campgrounds in this area. No more detailed directions. LAT, LON: lat=37.52191, lon=-88.66211, (source: map) (accuracy: approximate) LINK TO GOOGLE MAP Pretty confident. Not verified. Updated 2/2014. This from a visitor in 2010: "In Southern Illinois a favorite swimming hole is the Kincaid Lake Spillway. The spillway is usually safe and pretty clean too. The water volume can be too much after a big rain, though, especially in the spring. Its pretty obvious when that happens though, I don't think anyone would attempt to get in it then anyway. The is a permanent earthen structure and all the excess water flows over the rock structure that is the spillway. when it gets to the bottom it joins back up with the original creek valley." From Murphysboro go about 10 miles west on RT 149 then, at the bottom of the hill, go north (right) on Spillway Rd. and go about 1 mile to a parking area. You'll see it (and probably hear it) as soon as you get in the parking area. Of course, there are a number of flooded quarries around Bloomington, IN, as famously shown in the movie "Breaking Away". We do not list these as they are both illegal and unsafe. There are many objects in and under the water there and jumping and diving are very dangerous. Here is Wikipedia information about one of these: WEB SITE . Long-time local swimming places in rivers around Columbus, IN. We have very little information about these places. CAUTION: All these places are in rivers, no lifeguards, river levels can be high at times, people have drowned recently at some of these places. Look carefully before you go in. Obey local laws and avoid private property. For details, see DIRECTIONS below. All are in the Columbus area. Addresses and coordinates are provided below. Use these to get directions. ANDERSON FALLS [ANDE]: A very wide, low (10 feet high) waterfall, in the Fall Fork of Clifty Creek, with places to swim at the bottom. Reliable flow all year. The far side of the creek is the nature preserve. You have to walk across the creek above the falls to reach the trails there. From I-65 at Columbus, exit at RT 46 and go east for about 15 miles. Just after you pass through the small town of Newbern, turn south (right) onto RT 925 E. which very soon turns left on RT 200 N. Go about 2 miles and turn north (left) onto RT 1140 E. You will see a sign and a parking area on the left past the sign. LAT, LON: lat=39.23724, lon=-85.69945 (source: map) (accuracy: approximate) LINK TO GOOGLE MAP. Very confident. Not verified. Updated 1/2014. OWENS BEND PARK [OWEN]: Traditional swimming place in Flat Rock River. Has boat launch. WEB SITE . No further details. ADDRESS:E 550 N & River Rd, Columbus, IN 47203. LAT, LON: lat=39.28170, lon=-85.9078 (source: map) (accuracy: approximate) LINK TO GOOGLE MAP. Pretty confident. Not verified. Updated 1/2014. HEFLEN PARK [HEFL]: Traditional swimming place in Driftwood River. Has camping. WEB SITE . No further details. ADDRESS: 4323 W. 700 N., Edinburgh, IN 46124. LAT, LON: lat=39.30400, lon=-85.9078 (source: map) (accuracy: approximate) LINK TO GOOGLE MAP. Pretty confident. Not verified. Updated 1/2014. NOBLITT PARK [NOBL]: Traditional swimming place in Flat Rock River in a city park in downtown Columbus. No further details. ADDRESS: 17th St west of Washington St., Columbus IN. LAT, LON: lat=39.21571, lon=-85.9264 (source: map) (accuracy: approximate) LINK TO GOOGLE MAP. Pretty confident. Not verified. Updated 1/2014. THIRD STREET BRIDGE [THIR]: Traditional swimming place in the East Fork White River under a bridge in downtown Columbus. No further details. ADDRESS: Third St. at the river bridge, Columbus IN. LAT, LON: lat=39.20107, lon=-85.92575 (source: map) (accuracy: approximate) LINK TO GOOGLE MAP. Pretty confident. Not verified. Updated 1/2014. LOWELL FISHING SITE [LOWE]: Traditional swimming place in Driftwood River. No further details. ADDRESS: Lowell Road at County Road 325W. LAT, LON: lat=39.23933, lon=-85.9730 (source: map) (accuracy: approximate) LINK TO GOOGLE MAP. Pretty confident. Not verified. Updated 1/2014. Several quarries in this area have been privately developed into water parks with diving, zip lines and other fun water stuff. For details, see DIRECTIONS below. At sites - swimming is not included with camping fees. WHITE ROCK PARK [WHIR]: (AKA St. Paul Cliffs) Three quarries privately developed into an elaborate water park with swimming, sliding, jumping, diving (3 level platforms) zip lines. Fee. Camping at site. WEB SITE , YOUTUBE . ADDRESS:7080 S 750 E ST. PAUL, IN. 47272 PHONE: 765-525-3483. To get here from County Road 800 south (above), go into St. Paul and start looking for signs that say White Rock Park. Starting at the railroad tracks there are signs at every turn to bring you in. LAT, LON lat=39.42018, lon=-85.6318(source: web site) (accuracy:approximate) LINK TO GOOGLE MAP. Very confident. Not verified. Updated 1/2014. PARADISE WATER PARK [PARA]: This from a visitor in 2010: "We did a cross-country drive and went to a great quarry in St. Paul, IN, about an hour south of Indianapolis. It's at a campground called Hidden Paradise. It wasn't free. It was something like $10 a person (age 13 and up), but we were there for hours and it was a blast. There are trampolines and things to slide and climb on, and a nice dock, where the kids looked at the small fish. It's plenty deep - at least 10 feet or more, and my 11 yr. old daughter learned to dive here. There was hardly anyone there mid-week - just our family and two other children. There is also a river (Flat River) nearby for tubing, but I didn't check it out." WEB SITE . This is a privately owned campground and swimming quarry at Hidden Paradise Campground, 802 E. Jefferson St., Saint Paul, IN, 47272. To get here from County Road 800 south (above), go into St. Paul, take East Jefferson St. southeast and the water park and campground are on the right just before you cross the river. LAT, LON: lat=39.42482, lon=-85.62652, (source: map) (accuracy: approximate) LINK TO GOOGLE MAP. Very confident. Not verified. Updated 1/2014. This from a visitor: "I know you are mostly interested in creeks and streams, but this is so unique, and so difficult to pull oneself away from, that I thought you might include it. 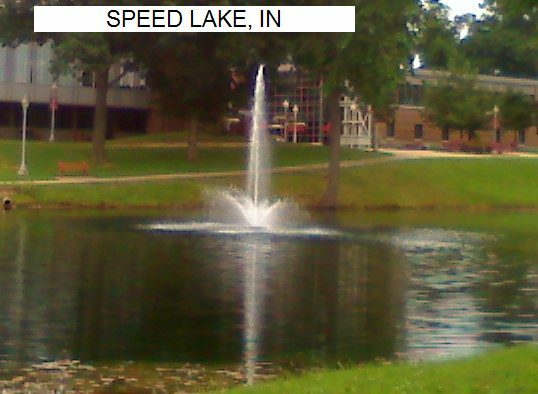 It is in Terre Haute, IN on the campus of Rose Hulman Institute of Technology. There is a small lake on campus that is open for swimming to anyone. 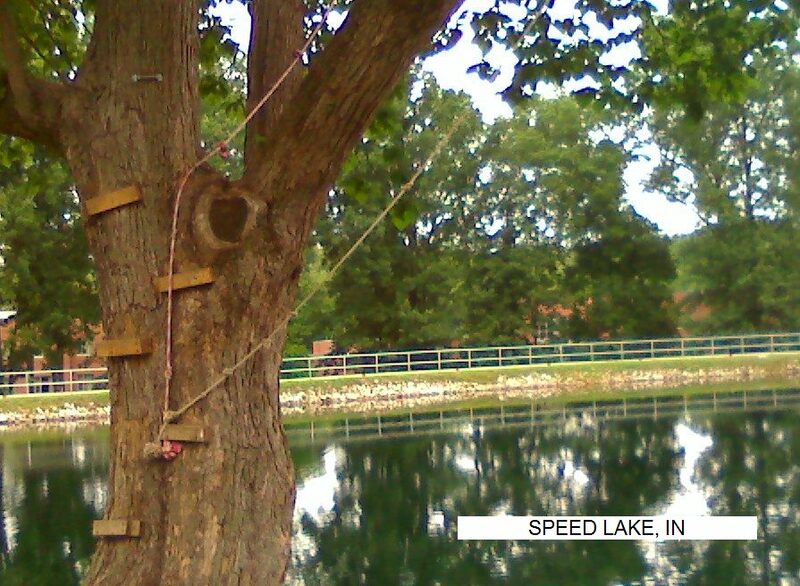 There is a small sandy area, a diving dock in the center of the lake, and tall tree with two rope swings. None of the lake is off limits, including under a floating fountain, an excellent place to park an inner tube on a sweltering day. The lake is treated to keep moss and algae under control, and the water is clear and warms up very fast in the summer." 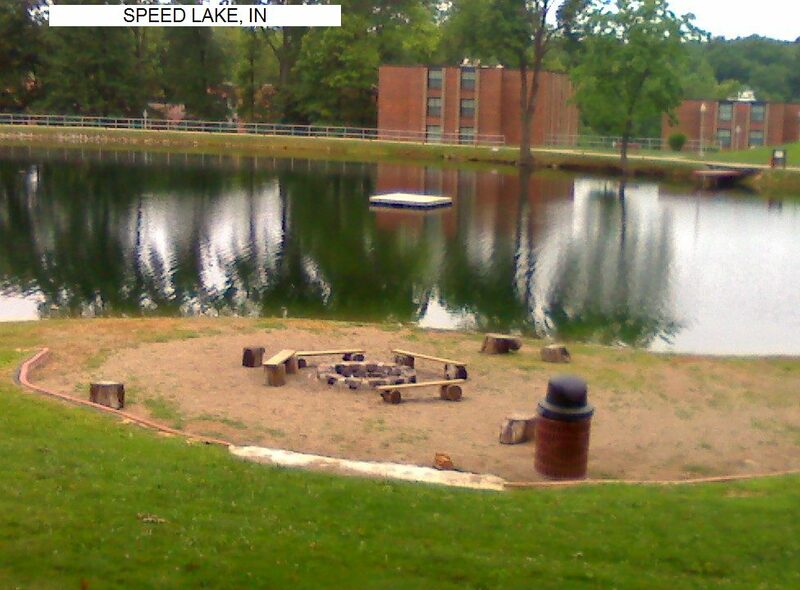 This from a visitor: "Rose Hulman is located on the east side of Terre Haute, right on RT 40 (a.k.a. The National Road). From the center of town, travel east on RT 40 to the campus. (From I-70, exit to RT 46 West and follow it until it ends at RT 40. Turn right, (east).) The campus is on the left about 1/2 mile from the intersection of RT 40 and RT 46. After entering the campus, turn left where the entrance road stops at a T. Park in the lot across from the basketball courts next to Speed Hall dormitory. Walk past the courts behind the dorms and you will be right at the sandy area. The rope swings are to the left. The Raccoon River Valley Trail is 56 miles of paved hike/bike trail. This section is north of Redfield. Swimming and sunning places along the river not far from Redfield. There is a $2.00 fee per person per day. All facilities at old train depot. Take I-80 to Exit #100 and go north 8 miles to Redfield. Parking is by the old train depot just off the hwy on south side of town. Bike or hike west on the trail. Just a couple of miles west of town on the trail on the left are several visible trails down to river sandbars. Go to the bend in the river for more privacy. The Iowa River, near Decorah, is a Mecca of canoeing, kayaking and tubing. It is mostly shallow, but there are a few deeper swimming opportunities at some DNR access points. There are DNR river access points both upstream and downstream of Decorah. Some of the access points downstream (east on River Rd. )of Decorah that you might explore (not certain of swimming at these places) are: Upper Dam Access at 43.32276,-91.68657; Lower Dam access at 43.34125,-91.6430; Iverson Bottoms Access at 43.41276,-91.57699 (Iverson Bridge). CAUTION: There are dams as some of these access points which can create strong currents. People have drowned here in recent years. Check the current before you go in. From Rochester, take RT 52 southeast (through Chatfield and Preston) to Decorah. The Upper Iowa River runs through Decorah and there are DNR access points both to the east (off of River Rd.) and the west (off of Pole Line Rd.). No more specific directions.